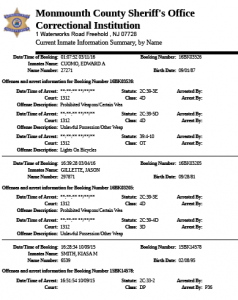 The Monmouth County Sheriff’s Office provides the Current Inmate Report on this web page as a public service. This information is updated on a regular basis to insure that it is current, complete and accurate. Warning – Misuse of the information contained on this link to threaten, harass or intimidate may subject you to criminal prosecution or civil liability!